The Sales Pipeline template for Excel allows the efficient management and reporting of sales pipeline data. Sales data can be entered or linked from external sources in a structured format with attributes for sales representatives, leads, process stages, products and services. 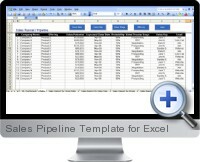 The Excel sales pipeline template analyzes the data to produce reporting for sales performance and trends automatically. The template facilitates structuring, maintenance and management of sales pipeline data. Sales reports are generated automatically to quickly gain insights into monthly sales performance with pipeline and funnel analysis. Sales pipeline reporting consists of customized fields for attributes including sales leads, reps, processes, products and services. The reports are set up to summarize data for simplified decision making and professional reporting purposes. The Excel sales pipeline template includes unlimited updates to newer versions and access to tools and materials for improving business via sales pipeline and dashboard reporting.